Ace Hardware is a member of the largest retailer-owned hardware cooperative in the industry. Ace Hardware began as a small chain of stores in 1924 and has grown to include more than 4,600 stores in 50 states and more than 70 countries. As part of a cooperative, every Ace Hardware store is independently owned. From neighborhood hardware stores to lumberyards to super-size home centers, each Ace Hardware is unique and tailored to meet the needs of its local community. Ace is committed to being "the Helpful Place" by offering our customers knowledgeable advice, helpful service and quality products. Apex of Edisto — Pest management, inc.
Apex of Edisto Pest Management, Inc. is a genuine, family owned company that operates on honest old-fashioned service. They answer all calls and show up on time ready to meet the customers’ pest control needs. "Our motto is 'Doing the Right Thing.' We mean it and to us that means we treat everyone like we would our own family: fairly, honestly." Since 1981, Aqua Blue pools has been the Lowcountry's leading pool company, and the areas ONLY Master Pools Builder. Discover outdoor living trends including pools, spas, fountains and water features. Preferred Quality Painting is Edisto's premier painting company. Specializing in interior and exterior painting, dock maintenance and repair, drywall work, cabinet painting, ceiling texture removal and repair, and concrete staining and finishes. Highly qualified proffessionals offering outstanding sevices to the Edisto Island area since 2002. Edisto Dog Spa offers professional mobile dog grooming at your home or business. Dog grooming services for residents and visitors alike. We come to you and groom your pet in our brand new mobil dog grooming van. No long waits in a kennel or driving into town. We do what's best for your pets! Edisto Kennels is the perfect vacation getaway for you r pet. Weather you are on vacation and don't want them to be too far away, or you are local to the Charleston/Edisto area, Edisto Kennels offers the perfect place for a fun, safe, and secure stay for your dogs. Grooming and bath services are also available. Founded in 1947, Hamilton's Fine Furniture, located in historic Walterboro, South Carolina, is a family owned and operated business. With a spacious 20,000 square foot showroom and room-style displays, Hamilton's Fine Furniture has earned an excellent reputation for selection, value, dependability, and customer service. They also provide a quick and professional delivery service so that you can enjoy your purchase in no time! J&J Services have been repairing and replacing HVAC systems on Edisto and surrounding areas for 10+ years. With prompt, honest, and courteous service, you can trust J&J for all of your HVAC needs. Corley Contracting Services is a fully licensed and insured contracting and HVAC specialist. Available for all of you in home repairs , painting, plumbing, electrical and more! 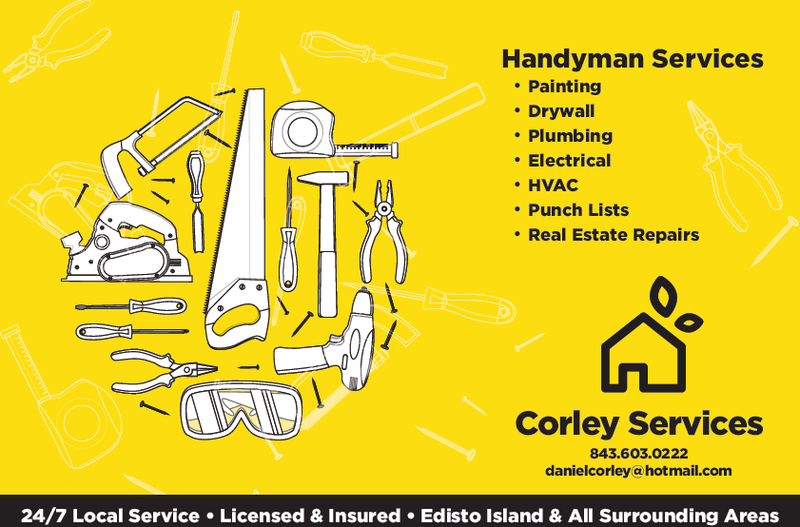 Call Dan Corley to get it fixed! Youmans Gas & Oil Co. Inc. provides residential and commercial propane services, tankless water heater and gas fireplaces sales and installation, as well as existing and new home installation and services. Call them a call for all of your natural gas needs!